In 2009, the American journalist Christopher Caldwell published his book “Reflections on the Revolution In Europe: Immigration, Islam, and the West.” The title is, of course, an allusion to Edmund Burke’s “Reflections on the Revolution in France”, a founding text of modern Conservatism and a classical critique of the French Revolution that first appeared in 1790. Caldwell’s book is well-written and might seem persuasive to a casual reader. But as I will show in this and further posts, once you start to look into them more closely, many central claims fall apart. The main technique that Caldwell employs is framing the story early on. If you buy into his grand vista of what is going on in Europe, you hardly need arguments, just illustrations that reinforce what you already think you know. The framing technique starts right in the very first chapter which is entitled “Rivers of Blood.” Readers from the UK will immediately understand the reference. On April 20, 1968, the Conservative politician Enoch Powell delivered a speech which became known as his “Rivers of Blood” speech. I am German, and I have to admit that I had never heard of it until I read Caldwell’s book. But then I would have recognized April 20 as Hitler’s birthday, you have to give me that. Christopher Caldwell, of course, taps into this sentiment. But then this was just a prediction in 1968 that at first glance turned out to be totally wrong. Maybe I missed something, but I am not aware of burning ghettos, cities being taken over, or the Thames foaming with blood, much of it. So why would Caldwell want to start off with something like this? Well, as I said, this is about framing. Once you have absorbed Powell’s gloomy view, you don’t need an argument that the UK really is in a state of civil war, or that there are burning ghettos and massacres. All you need are a few tidbits that show you that something was not perfect over the past 40 years. But still, why should you buy into such a deluded vision? The main argument is that Powell made one prediction that turned out to be very accurate, and that has baffled a lot of people ever since. So if he could make one astonishing forecast that was right on, he probably had some deep insight into the situation. Maybe “Rivers of Blood” and all the rest have not yet materialized, but then Powell might have been just a little off, and it is still in store, perhaps in a few years or so. At first glance, this is impressive and comes out of nowhere. But Enoch Powell was no clairvoyant. He, or whoever he relied on for his prediction, simply did his homework. Maybe this was somewhat harder to do in 1968 when computations still mostly meant paper and pencil. But then I will explain how I could obtain exactly the same forecast in Excel, which goes to show that there is no rocket science behind it. What are the assumptions that Enoch Powell starts from? Christopher Caldwell writes that there were “barely over a million” nonwhites in Britain at the time. In the respective footnote, he gives the exact number as 1.25 million. As is also clear from another quote from Enoch Powell, he assumed net immigration of nonwhites at a level of 50,000 a year. I have no idea where the non-metric horizon of 34 years from 1968 to 2002 comes from. But anyway, how many nonwhites would you expect in 2002 with those assumptions? If you tried a naïve forecast, you would arrive at 1.25 million + 34 * 50,000 = 2.95 million, which is, of course, too low. And maybe that was also Christopher Caldwell’s and many other people’s first guess. So against this benchmark, Powell’s forecast was remarkably good. It looks like magic. Enoch Powell must have known something that is not obvious, a deep insight that let him come up with such an accurate figure. However, you don’t have to have any special insight. The reason is that the naïve analysis is false for a reason. If you have read my previous posts (cf. “Misinterpreting Growth of Immigrant Populations” and “Swamping by Immigrants is Hardly Possible”), you might guess what it is: It’s the momentum effect, stupid. The momentum effect means that if you have 1,000 immigrants, they are usually young people who will start families soon. So after only a few years, there will be 1,000 children or a doubling of the population even if you assume only replacement fertility. After some time there will be another 1,000 grandchildren. But since some of the initial immigrants will have died by then, the population comes out somewhere below 3,000, or with the assumptions in my other posts: at about 2,760. And after that, it levels off. So a population of 1,000 immigrants grows to about 2,760 descendants (and to stress it: this is assuming replacement fertility!). Now, this growth from 1,000 initial immigrants to 2,760 descendants is the case for one-time immigration in a single year. However, Enoch Powell assumed immigration of a fixed number each year. I have done the calculations for this in my post “Swamping by Immigrants is Hardly Possible” (assuming stylized mortality and birth patterns, immigration at age 25). The result is that with 1,000 adult immigrants each year, the whole population including descendants will grow to about 65,000 people after 34 years. There are 34,000 (= 34 * 1,000) immigrants, and the momentum effect almost doubles this number. And now I take my magic wand, and make my forecast: Since there were 1.25 million nonwhites already in 1968, and assuming 50,000 immigrants a year, my prediction for 2002 is: 1.25 million + 50,000 * 65 = 4.5 million. That’s exactly what Enoch Powell had, and my prediction would have been just as accurate as his. But then I could have delivered my own “Rivers of Champagne” speech in 1968. Only I would have combined my forecast with the prediction of a peaceful, prosperous, and vibrant country that’s powering ahead. And if the argument is correct that someone who can get the figure for 2002 right must have very deep insight into what’s going on, you would have to believe my other predictions just as much as those Enoch Powell made. That can’t be right, so the claim is false for both of us. There has to be a momentum effect also for the initial 1.25 million nonwhites because most of them immigrated in the 1960s. Probably fertility was above replacement as it also was for the native population at the time. This might have gone on for some time afterwards. Actual immigration from the relevant countries was somewhat higher than the 50,000 in the calculation. There was perhaps also emigration: some went back home and others moved on to other countries. The interesting thing is that those other effects mostly cancelled out, and so the forecast was pretty accurate. As I claimed in my post “Misinterpreting Growth of Immigrant Populations”, the momentum effect is almost all it takes to explain such developments, and common explanations (chain immigration, brides from back home, extreme fertility, diaspora dynamics, etc.) are at best second-order effects, or often simply besides the point. There is only one thing that truly baffles me, namely how close I come: the exact figure I got was 4499,9757 which is off by only 243! Enoch Powell’s speech made history also in another way. The Beatles recorded “Commonwealth” on January 9, 1969, which poked fun on Powell. The song morphed into “Get Back” over the following sessions which originally had some rather different lyrics. If you have open borders, does that mean that a right to asylum is superfluous? It would seem that way because for the most part the right to asylum now signifies that someone has the right to stay in a country, and under open borders practically everyone has such a right anyway. Perhaps someone would receive more support as an asylee than otherwise. But that seems secondary and would probably follow from general humanitarian considerations alone, not from some right to asylum. Most countries in the 19th century had open borders or something that at least came close. And many countries also had some right to asylum. But the meaning of the latter was much narrower and quite different from how the term is understood today: An asylee could not be extradited. First, some other country had to demand extradition. And only then did it become important whether someone had to be considered an asylee or not. Extradition was possible for common criminals according to a system of bilateral treaties that regulated when someone had to be delivered up. Usually, there were some restrictions, e.g. a country would not extradite someone if the „crime“ was not a crime according to its own legal system or the expected penalty appeared excessive. But in general, there was the perception that it was in the common interest of all countries to cooperate when it came to fighting crime. Basically, this has not changed since then. However, the exception were crimes that were „political“. Again, the word had a much more definite meaning than today. In current parlance, the adjective „political“ goes with „politics,“ a rather vague concept. But in the older usage, something was called „political“ if it referred to the „polity,“ or in other words that part of society organized on coercive terms: the state. Hence In the 19th century (and in a strict sense also today), „political crimes“ denoted acts that were directed against the state and the political order. Examples would be treason, high treason, an attempt to usurp the throne, participating in a coup d’etat, revolution, or an insurrection, and also acts of terrorism, such as assassinating or attempting to assassinate a head of state. Louis-Napoléon Bonaparte (1808-1873), later the French Emperor Napoleon III, grew up in Switzerland where he served in the army and became a citizen of the Canton of Thurgau. In 1836, he attempted a coup d‘etat in France which failed. He was imprisoned, but released on the condition that he went into exile in the US. He did that and moved to New York. But the following year, Louis-Napoléon returned to Switzerland when his mother was on her deathbed. France demanded his extradition, but the Swiss refused to comply. To put pressure on Switzerland, the French army mobilized, and a war was only averted when Louis-Napoléon went into exile in London. The Hungarian Revolution was surpressed by Austrian, Croatian, and Russian troops in mid-1849. The last insurrectionists under Józef Zachariasz Bem (1794-1850) fled to Turkey, where Bem, his officers and generals, as well as 6,000 Hungarian and Polish soldiers converted to Islam. Austria demanded their extradition. But the Sultan refused, backed by British Prime Minister Lord Palmerston. As Franz von Holtzendorff notes: „Also today it should not be forgotten that it was a Muslim government that protected persecuted Christians from the wrath of a Christian government.“ Giving in to further pressure, the Sultan transferred Bem, now a commander in the Ottoman army, to far-away Aleppo where he suppressed a pogrom against the Christian population in 1850. In 1854, Jules Jacquin, a French manufacturer and one of his workers, Célestin Jacquin, who both lived in Belgium, tried to blow up the train of Emperor Napoleon III with an „infernal machine,“ a load of dynamite triggered when the train moved over it. France demanded the extradition of the two assassins, but Belgium eventually declined. However, France pressured Belgium into changing its legislation in 1856, so that assassination of a foreign head of state was reclassified as a common crime and hence the perpetrator could be extradited. But this change was not applied retroactively to the Jacquins. In 1879, Leo Hartmann (1850-1913), associated with the „Narodnaya Volya“ (People’s Will), tried to blow up the train of Tsar Alexander II near Moscow. He fled to France which refused to extradite him to Russia. Hartmann was later expelled from France and went to the US, but eventually returned to France where he died in 1913 (Russian Wikipedia claims he died in New York in 1908). The backdrop to Franz von Holtzendorff’s book was the tense situation in 1881. After two assassination attempts on the German Emperor Wilhelm I in 1878, Bismarck had pushed his Socialist Law through which outlawed the Social Democratic Party and its organizations although the Social Democrats were not responsible for the attacks. The party moved their headquarters and press to Switzerland. When in early 1881 members of the „Narodnaya Volya“ finally succeeded in assassinating Tsar Alexander II, his son and successor Alexander III called on other countries to join Russia in its fight against terrorism. Interested in improving relations with an ally, Bismarck supported this move, and started to threaten Switzerland wíth an invasion if the Swiss did not extradite the German Social Democrats. But the Swiss did not cave in. On a rally in Zurich in support of the right to asylum, one militia captain named Bürgi even suggested that Switzerland become the 40th state of the United States of America. Only after a decade of further pressure, Switzerland eventually made concessions, but still did not extradite the German Social Democrats who just had to move on to Great Britain. 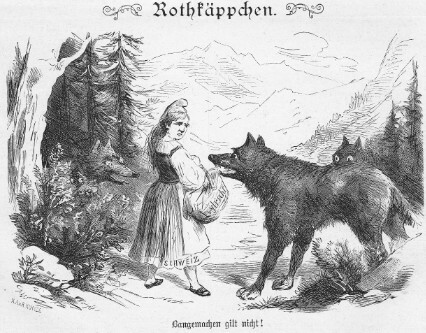 The above caricature is from 1881 and appeared in the German satirical weekly „Berliner Wespen“ (Berlin Wasps): „Rothkäppchen“ (Little Red Riding Hood, „Schweiz“ (Switzerland) written on her skirt) carries a basket „Asylrecht“ (Right to Asylum). She taunts the wolves with: „Bangemachen gilt nicht!“ (Scaremongering doesn’t count!). Why were political crimes considered as in a different class so that extradition was ruled out? The main explanation that Franz von Holtzendorff gives goes something like this: Common crimes are crimes against common standards. Murder is always wrong. Different countries may have different definitions and different sentences for common crimes, but there is a major overlap. And so in most cases, a murderer in one country is also a murderer in another country. That’s why countries can work together and should do so. Political crimes, though, are different because they refer to a specific political order. And political orders can and do change. E.g. whether someone has committed a political crime during a revolution depends on which side wins. As the saying goes: „One person’s freedom fighter is another person’s terrorist.“ And since there is no common standard, there is also no common ground for different states to work together as in the case of common crimes. There is rather a common interest in not cooperating. You could be on the losing side the next time, and then it would be good if other countries granted you asylum. And that’s why political crimes should be treated differently, and extradition should not be an option. There were vast differences between countries in the 19th century. The various states of the German Confederation (1815-1866)—with some exceptions like Hamburg or Frankfurt—often extradited those wanted in another state for political crimes because they had a common interest in suppressing the liberal opposition. As far as I can tell, also later Germany, Austria-Hungary, and Russia did not practice a right to asylum. In most countries, there was no explicit right to asylum. The decision was discretionary and made by the administration without recourse to the courts. The one exception was Belgium which codified a right to asylum already in 1833, and where the courts made the decision and not the administration. In other countries, as far as I understand it e.g. in France, granting asylum was for some time not so much a matter of principle, but more or less opportunistic depending on general considerations. In other countries, like Switzerland, the UK, and the US, asylum was a strong customary institution. Asylum cases were few, but very high-profile. Sometimes they could have extensive repercussions, especially for smaller countries like Switzerland or Belgium, and even create a situation where a war became likely. The right to asylum was only important if some other country demanded an extradition for political crimes, which probably is just as rare an event today as it was in the 19th century. Most reasons for granting asylum nowadays did not fall under a right to asylum at all. Religious or ethnic persecution, e.g. a series of pogroms in Southern Russia (now mostly in Ukraine) after the assassination of Tsar Alexander II in 1881, meant that many Jews tried to emigrate. They could immigrate freely to countries like the UK or the US, and this had nothing to do with a right to asylum. Terrorists had a right to asylum, at least as long as their deeds could be interpreted as trying to affect a change of the political system. Killing a head of state would qualify, killing people on the street would not. Terrorism in the 19th century was mostly of the first type although there were some exceptions. E.g. Irish terrorists, mostly operating out of Brooklyn, at one point tried to sabotage the transatlantic traffic between the UK and the US with „infernal machines“ (bombs with a timer). And during the Fenian Dynamite Campaign, subway and train stations in London were bombed in 1883 and 1884. The „Narodnaya Volya“ (1879-1884) had a narrow focus on high ranking officials and the Tsar, but later terrorists in Russia (Socialists-Revolutionaries, Anarchists, and Social Democrats, both Bolsheviks and Mensheviks) were less discriminating. Former heads of states, even if they might have been responsible for common crimes could not be extradited with a right to asylum. If an extradition was for a common crime, but there was a suspicion that this was a pretext to get hold of someone for a political crime, as a general rule, there could be no extradition. The most famous example was perhaps the German Emperor Wilhelm II who fled to the Netherlands at the end of WWI. The Allies demanded his extradition, but the Netherlands refused to comply. The right to asylum was not about being allowed into the country or being allowed to stay. That followed from other principles that were unrelated. Actually, it was possible that someone could obtain asylum and also be told to leave if he posed a risk (e.g. because the country wanted to avoid a war with a strong neighbor). An asylee was only safe from extradition to a country that wanted him for political crimes (or common crimes as a pretext). The right to asylum did not entail any support from the receiving country other than perhaps what anybody would have gotten. Since most of the asylees were well-heeled or had some organization behind them, there was probably no support at all for them. So what is now viewed as a central part of asylum was absent, namely humanitarian assistence. This would have been an entirely different issue in the 19th century, not part of a right to asylum. When it became clear that Donald Trump would be the 45th president of the United States of America, quite a few Americans felt an urge to leave the country. The website of the Canadian immigration agency crashed. And one thing many perhaps realized for the first time in their lives: Borders are closed. It is not so easy to escape if it were necessary. Welcome to the real world! Personally, I find the reaction understandable, but overblown. Yes, Donald Trump will be a horrible president, and he will make life hard for many people. That’s really sad, and words cannot convey how sad it is. But those will be illegal immigrants or travellers and potential immigrants from Muslim countries. He will be very careful not to go against most Americans because he wants to be re-elected in 2020 (start to get used to that thought). Comparing him to Hitler was hyperbole during the election campaign. Be very glad that it is not true. In my view, a Trump presidency opens up a golden opportunity to draw a lot of good people to other countries. Or for economists: Lots of human capital trying to move elsewhere. If other countries were smart, they would grab this opportunity with both hands, and open their borders for Americans. As a German, I think Germany should do it ASAP. If the European Union is worth anything, it should do it on a European scale. I would not expect many immigrants, but I love the principle also in this case. Now, there could be problems with American immigrants. They might come for the welfare, they might not be compatible with the culture here and not understand our sense of humor, they might work too hard and hate six weeks of vacation, they might be „böse people“ (= “bad hombres”) who commit crimes (the homicide rate in the US is more than five or even ten (!) times the homicide rate in Germany), and a few of you are even terrorists (Ted Kaczynski, Charles Manson, Timothy McVeigh, I am looking at you). That’s why I would want to make a proposal which may look a little complicated, but which I think can handle all this. Actually, Germany should not only open borders for Americans immediately, but also for anyone from another developed country. Let’s say Canada, Australia, New Zealand, Japan, South Korea and so forth. I would also propose a gradual implementation of open borders with all countries along these lines, which might take some time because there are so many people who are probably interested. And, of course, I would also recommend that other countries follow suit. But Germany could do it unilaterally, no need to wait until the whole world agrees on this. No American has to come illegally to Germany, and that’s why I’d be little lenient with those who do it anyway. It’s because I would think they might be a selection of people who have a reason to keep their stay secretive. The reason why it should make no sense to come illegally is that any American can apply for a Permanent Tourist Visa that as a rule is granted. This would include a background check to exclude very specific people (e.g. whether your first name is Donald and you have a weird hairdo). You might also have to pay a small fee and supply a deposit in an escrow account that would be sufficient to support you for some time and to send you back to the US if that’s necessary. If you have a Permanent Tourist Visa you can enter Germany at any time, travel around, and, of course, also leave. Unlike for a normal tourist visa, you can also rent accomodation. However, you are not allowed to work. Maybe we could make an exception if you are working extraterritorially (e.g. you do programming for an American company over the internet), but in that case, you would have to pay taxes in Germany. As a Permanent Tourist you can stay as long as you want. You might have to renew your visa perhaps once a year and pay a fee, though. You will have to fend for yourself or find someone who supports you. You have no access to the German welfare state, except in urgent cases, and then you would have to pay out of your deposit first. If you run out of money and need support, Germany will not let you starve to death, but will send you back to the US and refer you to the American welfare state which is actually not that different from the German welfare state. If you commit a crime, Germany will also send you back and bar you from the country for a time that corresponds to your expected penalty (let’s say five times average sentence for the crime). We will also guarantee that we will never extradite anyone for political crimes, if you have to expect cruel or unusual punishment (Germany does not have the death penalty) or due process in the US is in doubt: full right to asylum in an old sense. Also in a modern sense: We will not send you back if there is a civil war in the US or people like you have to fear for their life and liberty. You might want to work in Germany. Most people don’t have the money to retire early, most people do not have someone who pays for them forever. In that case you can apply for a Guestworker Visa. Since you can easily obtain a Permanent Tourist Visa you can come to Germany, find accomodation and a job. But you can also do that from home. If you have a job offer and have passed a background check (e.g. whether your middle name begins with a J and you don’t want to show your tax returns), as a rule you get a Guestworker Visa which allows you to work in Germany for three years. Of course, you have to pay taxes like everyone else. You might also have to pay a moderate fee and supply a deposit like for the Permanent Tourist Visa. Here is the deal: You can work, but you don’t have access to the German welfare state, except in urgent cases. Just like with the Permanent Tourist Visa, you will be sent back if you cannot make it in Germany: run out of money, need assistance and don’t have someone who supports you. You might also have to pay part of your salary into the escrow account. You will be refunded, once you return to the US. And since this is like a German government bond, you will also be paid interest on it (just kidding: yields for German government bonds have been negative lately). This serves as an incentive that you indeed return if you have to. If you commit a crime, you have to go back to the US and are barred from Germany for some time (see above). If there is no problem with you for three years, you can get another Guestworker Visa, or you can switch back to Permanent Tourist at anytime. In other words: you can stay as long as you want. After some time, you might find that it is quite nice here, and living in Germany is on a par with living in the US (although one American cosmopolitan instantly went into „USA! USA! USA!“ when I told him that). Maybe Progressives and Liberals will be disappointed with the German welfare state if they experience it firsthand. But then also Libertarians and Conservatives are in for a surprise: We don’t have a gulag either. I am not kidding you: this is not socialism, you can do a lot of business here. Now, if you find being a guestworker forever too unstable, if you resent always only paying to the German welfare state and never receiving anything in return, and if you uphold „no taxation without representation,“ Permanent Residency is the way to go. It works in two steps. The first one is Preliminary Permanent Residency. It is what it is called: you don’t have a time limit anymore (the rule), but there are some caveats (the exceptions). You can apply after a Guestworker Visa and at least three years without any problems, and maybe another background check (e.g. you did not lie about your German ancestry and said you were of Scottish descent, but we know that your grandfather changed his name from “Drumpf” to “Trump”). You might also have to reach a minimum in taxes and contributions you have paid over time: your balance. But it is like with a fire or life insurance: you first pay premiums without coverage in the event, but then you receive coverage after some time. You now successively obtain access to the welfare state which is not a blank check, but only kicks in for special cases. As a Preliminary Permanent Resident, at first you receive what a Guestworker does: nothing. However, that increases over time depending on your balance (what you paid in via taxes and contributions minus what you have received). If you draw your balance down, you go backwards, and you might even return to the level of a Guestworker until you have built it up again. In lockstep with your balance you get more and more access to the welfare state like to an insurance. When you have reached a certain level you have full access. If you cannot make it in Germany even with that, we will still send you back. But that now becomes more and more of an exception. The principle also applies to when you commit a crime. It depends on how far you have progressed. In the beginning, it is just like for a Guestworker, and you are out. But in the end, you are treated like any domestic criminal and there is no deportation anymore. There is maybe also a clause that you will be thrown out for extremely horrible crimes, let’s say, terrorism. Your deposit is slowly paid out to you from the escrow account (plus interest) as you progress. After you have achieved a target for your balance, and have been a Preliminary Permanent Resident for at least three years, you automatically become an Irrevocable Permanent Resident. That means you have full access to the welfare state and under no circumstances can you be deported. Actually, you are on the same footing as a German citizen. According to the German Basic Law, i.e. the constitution, a German citizen will not be extradited to any country outside the EU (it used to be for all countries). I already appealed to „no taxation without representation“ and I meant it. Permanent Residents do not have the vote. They might still have problems with getting visas for third countries (German citizenship is the best in this regard: the most countries you can travel to without a visa). After a few years of being an Irrevocable Permanent Resident, and maybe another target for your balance, you obtain the right to apply for German citizenship. There might be some conditions (e.g. something like a citizenship test) and some well-defined exceptions, but as a rule you cannot be denied German citizenship. Now, Americans, and fellow German citizens in spe, what do you think? I am talking about open borders for Americans with some minor hassles, and a way out of the country if it got really bad. And it would be such a smart move for Germany that, unfortunately, it goes beyond what German politicians can probably imagine. But maybe I am wrong. And more on a personal note: I’d so love to be swamped by Americans even if you bring your weird customs with you, like „Christmas pickles“ that are totally unknown in Germany. In the past few months readers have likely been barraged with messages about how voting for Trump is equivalent to declaring yourself a bigot. My preferred radio station currently has a series of ads encouraging listeners to vote ‘against misogyny and racism’ this upcoming election. Let me make the case that neither major candidate for US president is the clear ‘Open Borders’ candidate and that OB advocates would better serve the cause through other means. There are those who claim that Trump has normalized anti-migrant sentiment and Clinton should be supported as a symbolic gesture that one opposes such sentiment. As I often remind readers, I am an illegal alien. I bring this up because, although it is taboo to speak ill of migrants in polite company, it is still acceptable in most cases to speak ill of “illegal” migrants. “Legal migrants are hardworking and contribute to our society, but illegals are destroying our social fabric.” Throughout my life I have had to tolerate hearing some absurd claims ranging from low brow jokes (“Why doesn’t Mexico do well in the Olympics? Any Mexican who can run and jump is in the US.”) to outright racist comments. The thing about this is that I’ve heard these things throughout my whole life. I can’t point to a time when they ceased. Even Trump’s locker-room talk video was in my opinion mild. Just a few weeks ago I overheard a group of office workers talk about how they didn’t like Mexican men, but they liked Mexican women because of how ‘exotic’ they looked. It is true that Trump’s speeches are especially absurd compared to his contemporaries, but they differ in degree not kind. I suspect that a subset of Trump’s opponents dislikes him because he makes them realize how awful they themselves are. I am worried that after Trump loses (at time of writing Clinton has a 78% chance of winning in the betting markets) those who publicly opposed him will feel they have moral license to act against migrants. “I’m not racist, I voted against Trump.” Such an effect is not unprecedented. Political psychologists have previously found that endorsing Obama gave voters moral license to discriminate against – “I don’t dislike blacks, I voted for Obama”. There are those who believe a Clinton presidency will mean the passage of comprehensive immigration reform, and so a vote for her is one towards Open Borders on the margin. I am unconvinced this is the case. The republicans are likely to retain control of the House of Representatives for the foreseeable future (see the betting markets) and won’t allow legislative reform. It is possible congressional republicans would tolerate the passage of migration reform as part of an effort to re-brand the party – but I don’t see it happening. If the party had been serious about re-branding itself, it would have done so after Romney’s loss in 2012. I think in the near future party elites, from both major parties, will be too busy fighting their respective populist wings to enact any significant legislative reforms. President Clinton could end up enacting reform through executive actions in the same way President Obama has but reform in this manner has sharp decreases in returns. She can expand deferred action for larger portions of the unauthorized migrant population, but the legal fiction of deferred action is that it’s goal is to prioritize the deportation of other migrants. I am a doctoral student in a liberal California university so I am personally low on that priority list, but I am still on it. As are countless others whose only crime is wanting a chance to work to feed themselves and their families. At any rate what happens for those of us in the United States is of relatively little importance. We’re already in the United States. Deferred action expanded the number of opportunities for those of us here illegally, but we were here before it and will be here after it. As difficult as life in this status is, it is still a better quality life than what we could expect in our countries of origin. If it weren’t we would have gone long ago. Those who suffer the most, and for whom deferred action means little, are those who haven’t been able to migrate through legal or illegal means. We Mexicans are lucky; we need to cross only the US border. North Africans are also lucky; they only need to cross the Mediterranean. Those who suffer the most are those in Central America, Sub-Sahara Africa, and so forth and so forth who must cross multiple borders. Deferred action is not enough. If you are still undecided whether to vote for Trump or Clinton, do not feel compelled to vote for Clinton out of belief that she is the marginal pro-Open Borders candidate. She isn’t. Nor should you feel compelled to vote against Trump to signal that you aren’t anti-migrant. If you wish to signal your support for open borders you would be more effective by helping plan an event for Open Borders day,contributing to this blog, or countless other things. Victory for open borders relies on winning over minds, not votes. https://openborders.info is licensed by Michelangelo Landgrave under a Creative Commons Attribution 3.0 Unported License.